A little pinch of fairy dust...: Alphabet Series - "S"
I got the pose idea from the Snow White DVD cover and used a couple of different magazine clippings to develop the wavy hair design. The hair worked out a lot quicker than previous illustrations! 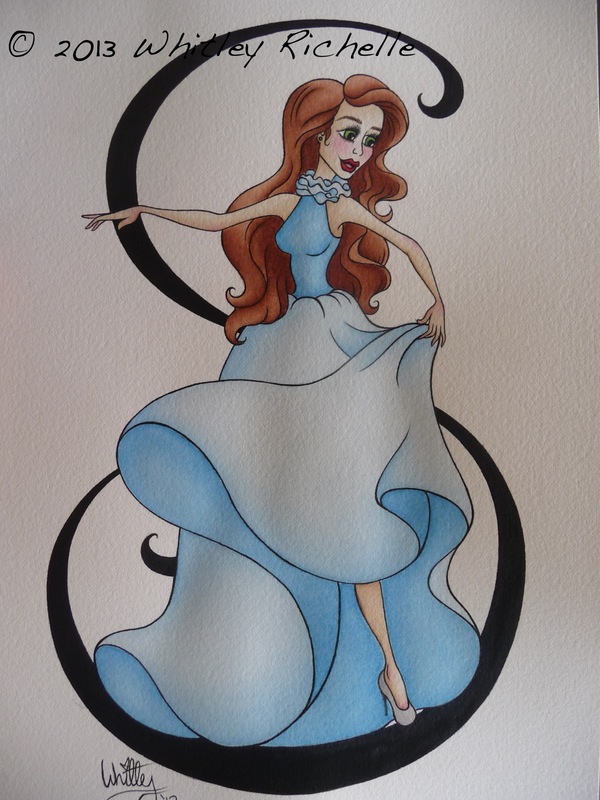 I used cerulean blue for the dress, using the faintest of washes and then layering countless times and slowly doing more in the shaded areas to achieve the ombre look. The hair is a reddish-brown I created using burnt umber and alizarin crimson. The skin uses faint washes of burnt umber, with tinges of rose on the elbows, hands and feet. The letter 'S' is so much easier to work with than other letters, as you can pretty much use whatever pose you desire, whereas with others you have to be careful in the body's placement for it may be difficult to tell what the letter is!